This display presents a diverse selection of formats, media, and conceptual approaches from the Smithsonian American Art Museum/National Portrait Gallery Library’s artist’s book collection. An artist’s book is a book or book-like object that is intended as a work of art by its creator. Often issued in limited editions or produced as unique works, artists’ books exist in a variety of shapes, sizes, and media. They challenge our common perception and understanding of the book, demonstrating that the book is not limited to the codex format. The inventive combination of form, text, and image in artists’ books invite us to unfold, unfurl, read, respond, act, and create. The artists’ books on view demonstrate the variety and depth of the genre. Maria Pisano’s Entangled reveals a delicate, layered floral design, whereas her X Y Z is a playful accordion-style book. Kurt Allerslev’s Hypotenuse (a2 + b2 = c2) juxtaposes organic materials with the form of a right triangle to communicate the parallels between mathematics and nature. Laura Davidson’s creations, including Visible Invisible, Inner Workings, and The Body Temple, artfully combine prints, found objects, paint, text, and wooden boards to produce sculptural books in codex form. Seasonal Turns: Four Accordion Books by Bea Nettles is a series of photographs that represent the four seasons. Finally, Fluxus artist George Brecht’s Water Yam is a conceptual work that invites participation, while Don Celender’s Artball is a set of “baseball cards” that encourages conversation and exchange. This installation is part of a larger project to discover and highlight the artists’ books in the Smithsonian Institution’s art libraries. A team of Smithsonian Institution librarians and interns is analyzing the accessibility of the collection through the library catalog; investigating new ways to explore the collection through digitization and social media; and exploring options for collaborative projects both within and outside the Smithsonian Institution, including an exhibition and an ongoing artist’s book blog. The AAPG Library is located on the second floor of the Victor Building at 750 9th Street and is open from 10 am to 5 pm. 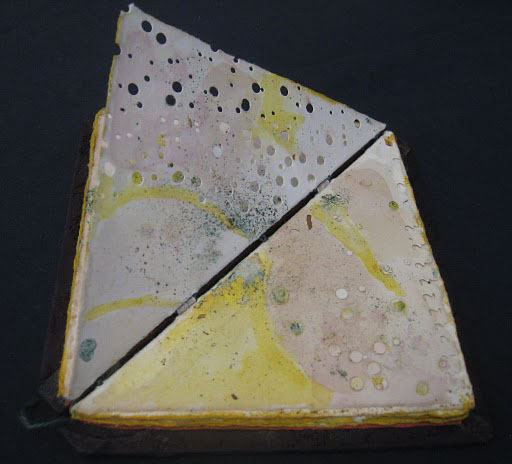 Image 1: Hypotenuse (a2 + b2 = c2) by Kurt Allerslev, 1999, unique, mixed media: beet juice, algae, turmeric, flower pigments, etc., mixed with plant and seaweed particles. 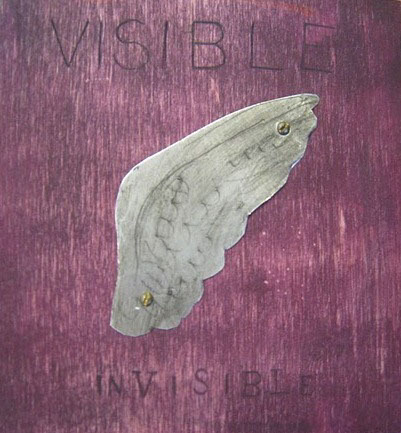 Image 2: Visible Invisible by Laura Davidson, 1992, 7 of 35, consists of one continuous sheet of cream paper folded to form 6 p. with handprinted lino cuts and other hand stamped illustrations mounted on 5 p.; bound in painted wooden boards with aluminum angel wing mounted on front cover.